After you take in registered users on your WordPress membership site, you might want to setup a members’ display page. It would be even better if you can display members of selected group on specific pages. Such pages will make people aware of your membership strength and draw in more users to your site. Here, we will use the ProfileGrid plugin to display group members of a specific group on a membership site. So let’s proceed by first activating the plugin on our site dashboard. ProfileGrid is exclusively created to build professional membership sites. It offers users certain essential tools like shortcodes and extensions that make it pretty easy to create a membership site. Besides, it has a whole page dedicated to shortcodes, found under the ProfileGrid menu on your dashboard. The shortcodes provide an easy way to perform many complex tasks. Creating a login or profile page or displaying a group wall or user location map are instances of a few. In the above picture, I have marked the shortcode that we will use to display members of selected group. 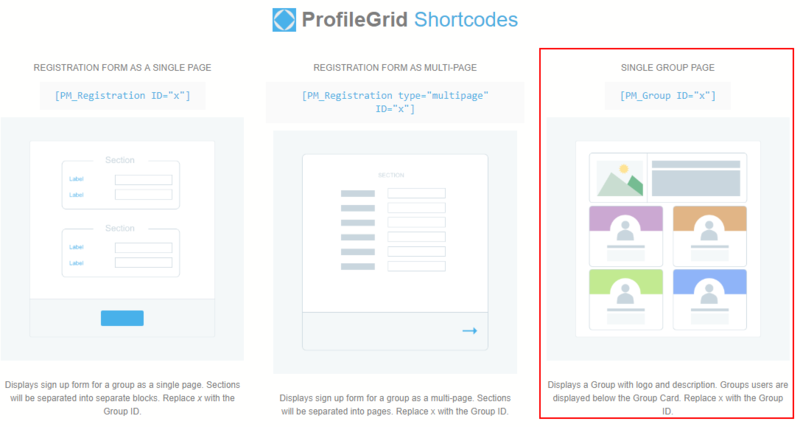 The [PM_Group ID=”x”] shortcode helps users to display the members of a single group on the frontend. Furthermore, we will copy this shortcode and paste it in a page to form the Group Page of a specific group. Now before proceeding to the next step, I will tell you from where you can retrieve the value of “x”. When you create a group, it gets listed in the Group Manager Page. Moreover, every group has a group id written on the bottom left corner of a group. Now in place of “x”, you have to put the group ID whose members you want to display on the frontend. So it’s time to put the single group page shortcode on a new page. 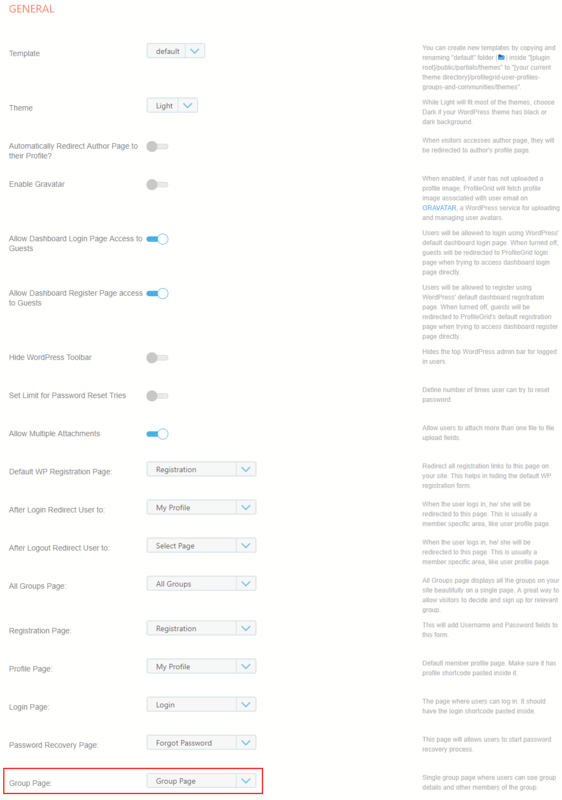 From the Pages section of your WP dashboard, create a new page. From the above image, you can see I have created a Group Page here. Further, I pasted the [PM_Group ID=”x”] shortcode and replaced the value of “x” with “3”. This means the new page will display members of selected group 3 on the frontend. Now click on ‘Publish’ to finish your backend job. Given above is the frontend view of the newly formed Group Page. We can see all the members of the Education group whose group id is 3 on the backend. This feature is of immense significance in a membership site. New users become interested to join your site when they see your member strength. This is a very important feature of the plugin where you finally assign a page with ProfileGrid. The plugin offers a few default pages. One can find them under the General option of the Global Settings page. From the above image, you can see a list of pages provided by the plugin. Now select the newly formed Group Page from the drop down beside Group Page. By doing so, you make your Group Page a part of the preformed pages of the plugin. However, for every group page you create, you need not assign them from here. 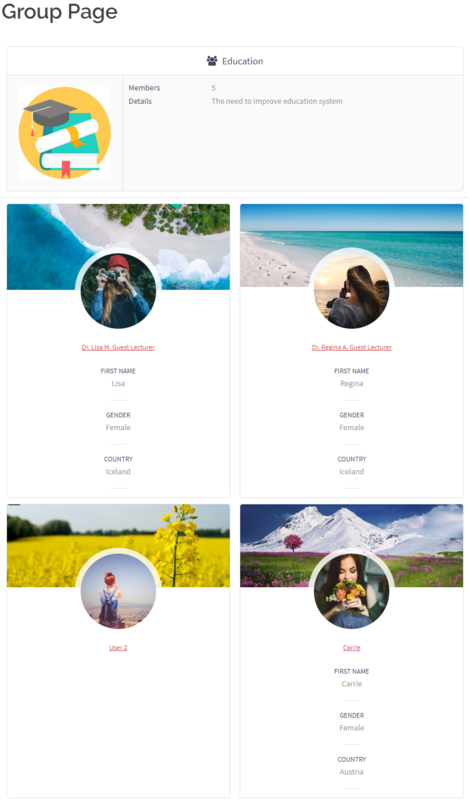 You saw how easily we could display members of selected group in the frontend. We didn’t have to code or design the page. However, we did everything with the help of one shortcode. Thus ProfileGrid is known for its ease of use. It is easy for amateurs as well pros. This is the reason why more and more users are choosing it as their preferred membership plugin.